The Howard Smith Wharves Revitalisation Project on the Brisbane River has taken a major step forward with the submission of a DA for a new boutique hotel building, multiple refurbished heritage buildings and two new lifts to the top of the cliffs. 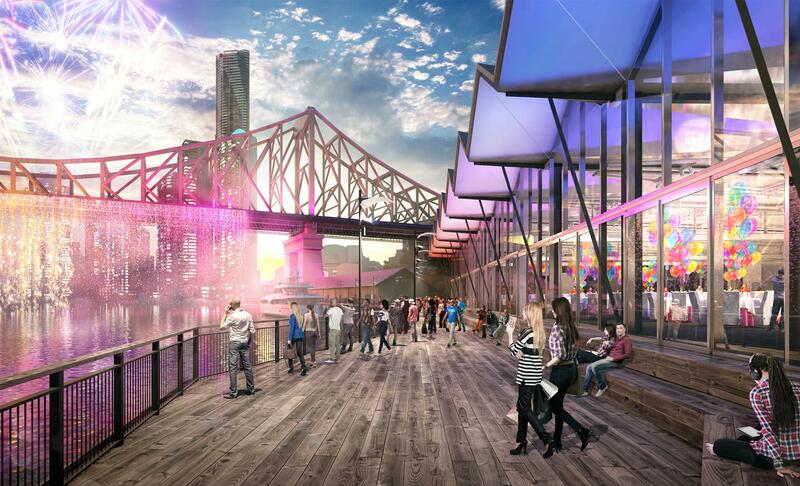 A new observation deck is also planned, with views of the Brisbane River and Story Bridge. "This is demonstrated by the variety of uses undertaken on the site. Furthermore, the proposal is 80% open space and is publicly accessible at any time of the day. "The redevelopment will feature an Art Series Hotel under the Story Bridge, which hugs the contour of the cliff. Hotel[/caption]Integral to its design was the idea that the building blends in with the cliff. This approach encouraged a design that allowed the heritage buildings along the water front to be uncompromised, and clearly distinguishable. Comprising 164 suites, the hotel also offers five retail and food and beverage spaces at the public ground level, a garden oasis, pool and sun lounges at level 3, and spectacular views across the river and of the bridge. Construction is anticipated to commence in the first quarter of 2016 and is expected to be complete by mid-2017.